Makes a choice to eschew fun in favor of pitch-black tonality...but kudos to Harcourt and Martin for their ambition in adding new dimension to an old story. 93 min. PBS. Cast: David Suchet, Barbara Hershey, Eileen Atkins, Toby Jones, Hugh Bonneville, Marie-Josee Croze, David Morrissey. According to the records-keepers, only the Bible and William Shakespeare have anything on Agatha Christie's sales numbers. The British Dame of mystery fiction had special success with Belgian detective Hercule Poirot, who starred in thirty-three of Christie's novels and fifty-one of her short stories. 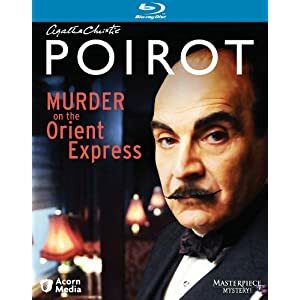 Since 1989, British television network ITV has been working its way through the Poirot catalog with actor David Suchet winning great acclaim for his portrayal of the meticulous detective, but only now has the series tackled Poirot's most famous adventure: Murder on the Orient Express. Christie's better-mousetrap mystery was made into a still well-regarded feature film in 1974 (with an all-star cast led by Peter Ustinov as Poirot). Though that version made narrative concessions to suit its cast, it remains the gold standard. The new telefilm adapted by Stewart Harcourt and directed by Philip Martin (Prime Suspect 7: The Final Act) doesn't slouch on the job, but it makes a choice to eschew fun in favor of pitch-black tonality. It's an interesting take, with interpolations that give the story an added thematic richness. A new prologue finds Poirot's bullying revelation of a murderer resulting in an unexpected suicide; shortly thereafter, the detective witnesses a woman's stoning on the streets of Istanbul. Poirot's cold adherence to a given culture's standard of justice becomes tested at the climax of this Murder on the Orient Express, which adds emotional heft to Christie's tricked-out ending, one that forces Poirot into a corner apart from the detective's customary triumph. The murder plot that serves as the core of the film remains pretty much faithful to the source, though—in the absence of any humor—audiences may find it plodding. Compensation comes from the ongoing game of "Spot the Actor." Once nasty businessman Samuel Ratchett (Toby Jones of W. and Frost/Nixon) is discovered stabbed to death, everyone becomes a suspect: exiled Russian Princess Dragomiroff (Dame Eileen Atkins), excitable American Caroline Hubbard (Barbara Hershey), manservant Edward Masterman (Hugh Bonneville), English Colonel John Arbuthnot (David Morrissey), English governess Mary Debenham (Jessica Chastain), Swedish missionary Greta Ohlsson (Marie-Josée Croze of The Diving Bell and the Butterfly) are but a few. Those who've never experienced the story will most enjoy this classic whodunnit, for its exceptionally clever climactic reveal. Longtime fans may consider it more of a curiosity, but kudos to Harcourt and Martin for their ambition in adding new dimension to an old story. Acorn Media sends home Murder on the Orient Express in a pleasing special edition that pairs the feature with a delightful documentary. The hi-def transfer leaves something to be desired, though given the source, it's a bit hard to judge if this is the best the picture could appear (given the compression artifacts that crop up, I'm guessing it isn't). Like a lot of British TV, this film has dull color and a generally soft appearance, but there are also moments of impressive clarity and even depth to the image. On the whole, it's a win for Poirot fans, as the picture certainly improves upon standard-def DVD. Audio comes in perfectly adequate, clear DTS-HD Master Audio 2.0 track that won't get audiophiles in a tizzy, but gets the job done. The principal bonus feature is "David Suchet on the Orient Express" (47:01, HD), in which the actor, giddy as a schoolboy, gets the royal treatment on the historic train. Suchet chats with Orient Express employees, historians, and fellow passengers, and he even gets a chance to take the controls and drive the train, which excites him no end. It's all very charming and quite informative, with Suchet giving a bit of the actor's perspective as he does his research in preparation for filming this most famous of Poirot stories. Three text-only extras fill out the disc: 120 Years with Agatha Christie, a bio of the author that emphasizes her still-strong influence; The Poirot Books (text only), a scrolling list of Christie's Poirot output, and Cast Filmographies. All site content © 2000-2019 Peter Canavese. Page generated at 04/18/2019 01:50:27AM.